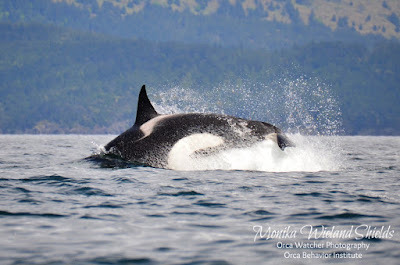 Orca Watcher: This is When We Use the Term "Epic"
When watching whales you can easily run out of adjectives as much of what they do is awesome to witness. Around here the word "epic" is usually reserved for those rarest, most memorable observations - like the one we had yesterday afternoon. 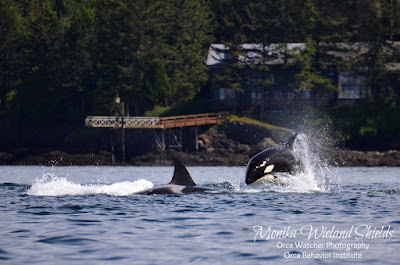 The T123 family group has been around for a couple days, and upon hearing they were headed towards San Juan Island it was too nice a day not to head out to try and see them. The first amazing sight awaited us before we even left the bay, however. 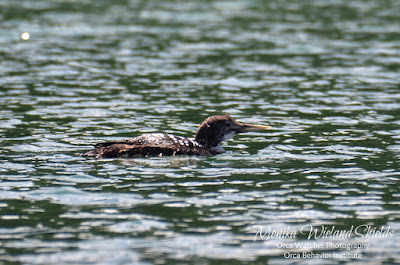 Something about this bird made me do a double take, and I'm glad we did a U-turn to get a better look - it was a yellow-billed loon! This species usually occupies the far north, and while they're occasionally seen in the Strait of Juan de Fuca and outer coast of Washington, I personally have never seen one outside of Alaska! 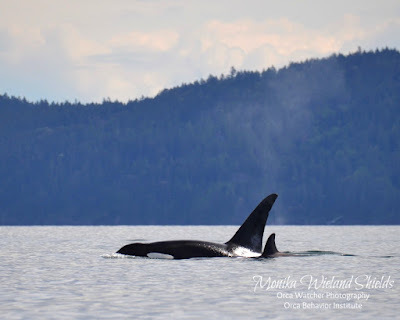 Normally that sighting alone would be enough to make my day, but with transients nearby and potentially heading away from us, we only took a short look to take some pictures before continuing on our way. Not a bad day to be on the water! When we met up with the T123s in San Juan Channel, they were heading south, but shortly after we arrived they turned back north, which was good news for us. This family group, which has been around a lot this spring, is made up of three whales: mom T123 Sidney, her adult male son T123A Stanley, and her five year-old daughter T123C Lucky. 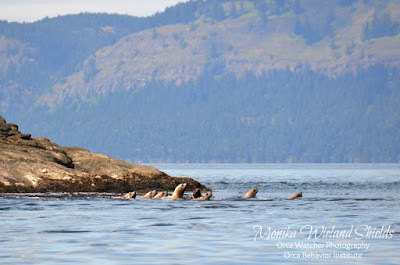 They made a turn into Spieden Channel, and out of no where, started hot pursuit of a Steller sea lion. These sea lions, which can reach weights of up to 2000 pounds, are regular prey for transient killer whales but no easy meal to take down. 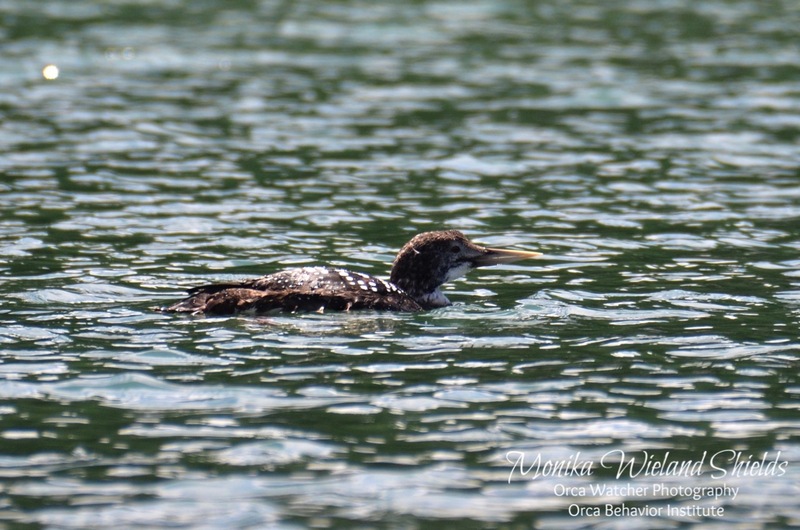 The Ts harassed this one for about 15 or 20 minutes, but it looked like he got away, as they didn't stick around long enough to feast. The chase, however, was indeed one of epic proportions. 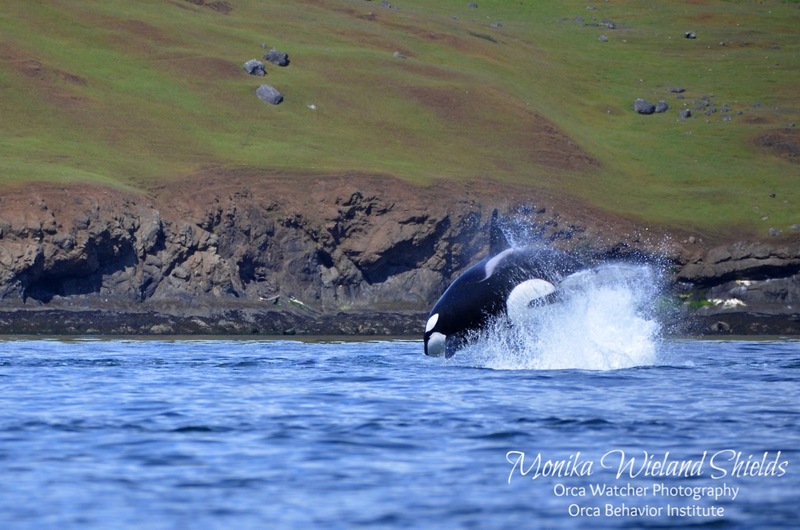 Not all hunts are dramatic, as sometimes they can take a seal and eat it without much indication of a predation event at the surface at all. 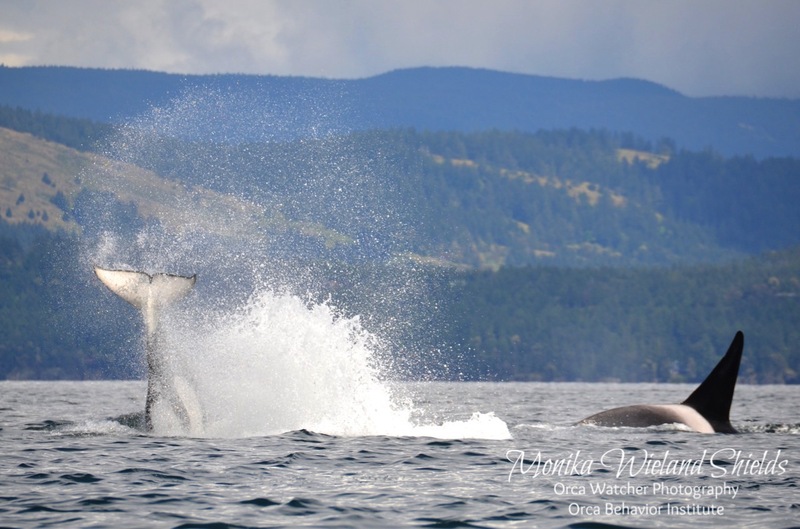 This one, however, had it all, with many aerials like dolphin leaps and surface lunges creating huge splashes of water in all directions. 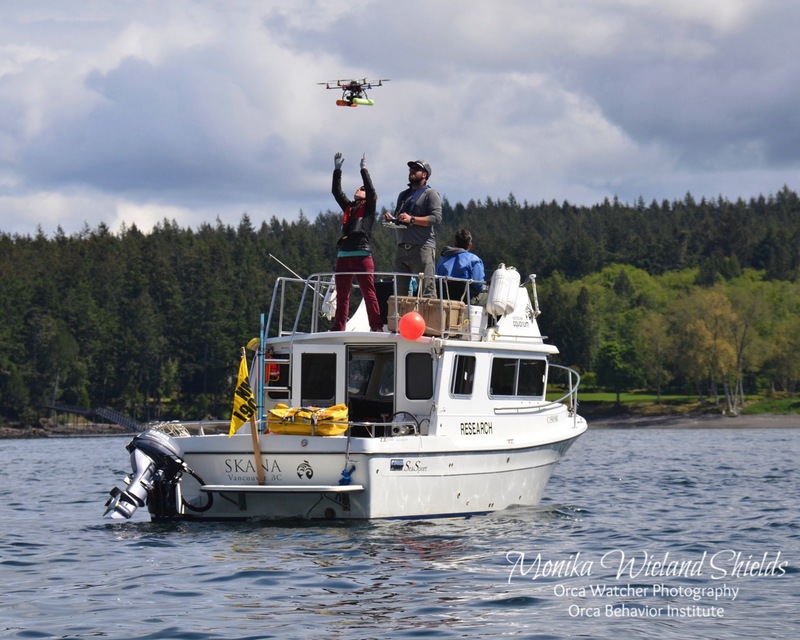 The Vancouver Aquarium research team was on the water with their drone, which they use in part to help assess body condition in Southern Resident Killer Whales. By chance, they had launched their drone right before this attack took place - I can only imagine what the whole thing looked like from the air, and hope they share it at some point! We were left speechless by the hunt, but as the whales seemingly gave up and moved on their way, the rest of the Steller sea lions at Green Point had plenty to say as they ganged up to make sure the orcas moved along. 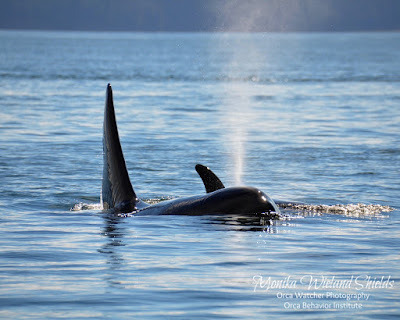 Things calmed down considerably after that, as many of the boats on scene headed home and the whales entered into a slow, comfortable travel doing long dives between surfacing tight together. 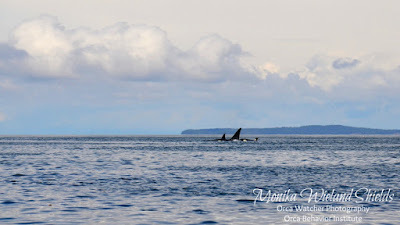 We had agreed to stay for one more surfacing and slowly motored along paralleling the track the whales had been on for the previous half hour or more. The minutes ticked by: 5...6....7...8, when I caught a disturbance out of the corner of my eye behind us. 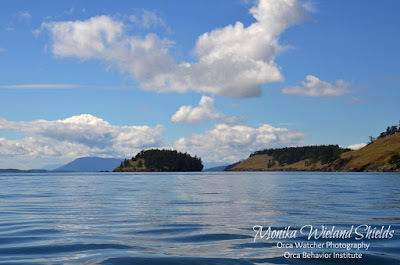 The whales had changed course and were right behind us, so we cut the engine and drifted as they approached. 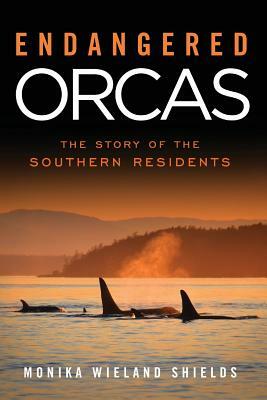 Without breaking the surface, she turned and continued on north after the rest of her family. 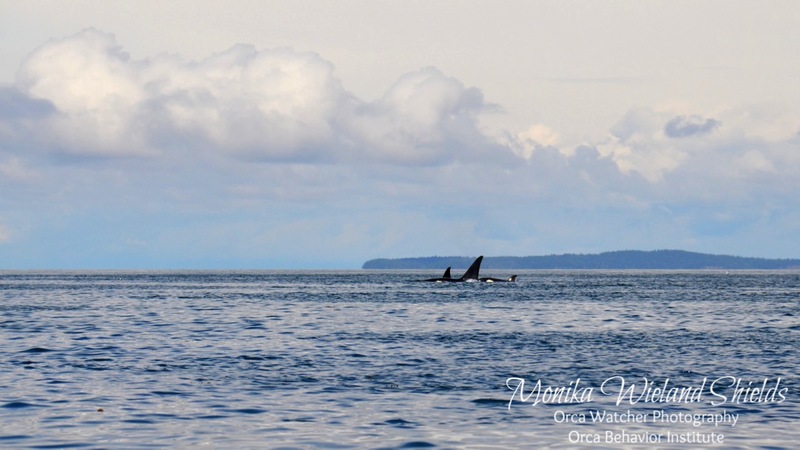 Again, we sat drifting in the boat, speechless, until they surfaced again nearly 10 minutes later a quarter-mile away. Epic, indeed. Yes, definitely "epic"! Incredible photo, shot from the hip!?!? I am so glad you had such a great encounter. This was awesome. 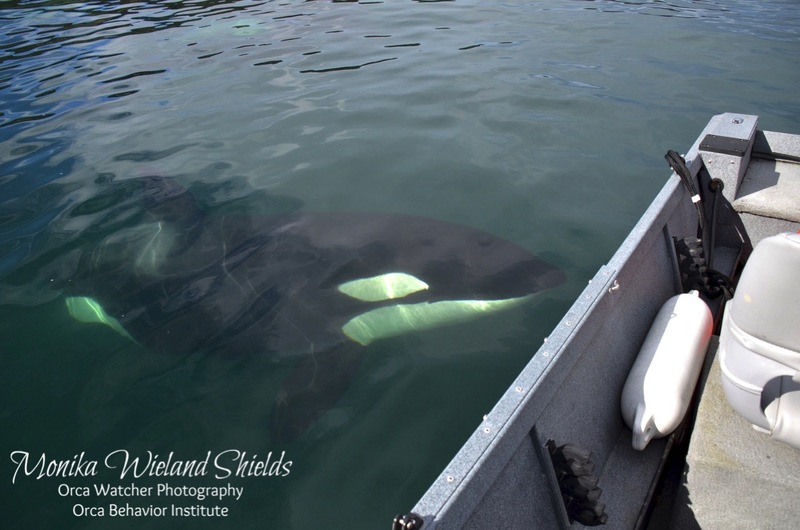 I do not know what I would do if an orca came that close to the boat. I think squeal in delight and scare the poor thing!